Next up were the gi-normous, ridiculously big and beautiful mushrooms he brought us. 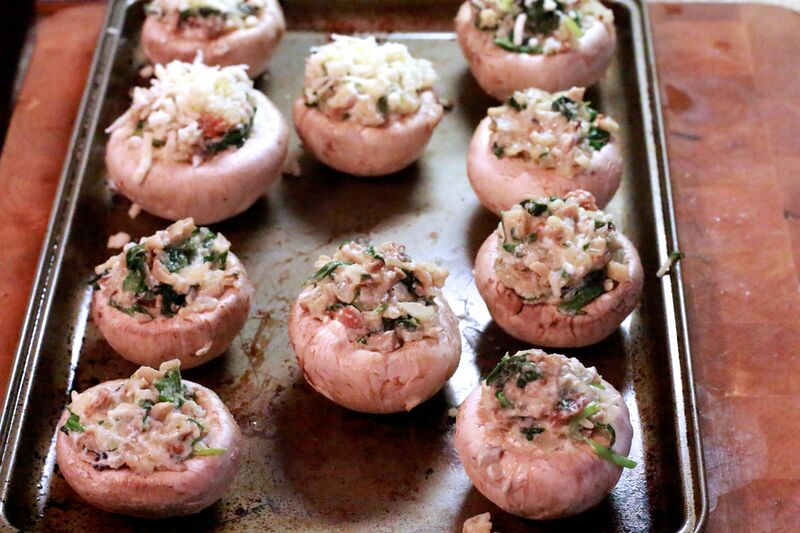 PERFECT for Stuffed Mushrooms! 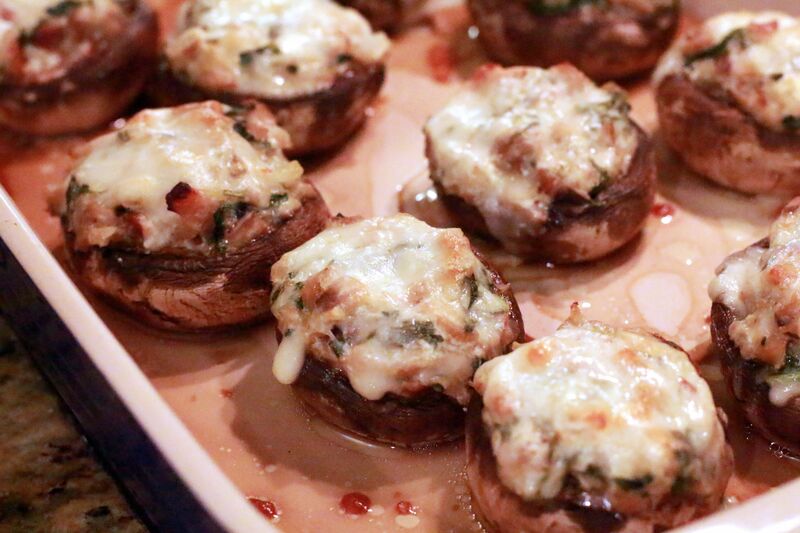 Except, well as silly as it sounds and simple as they are to make, I had never made stuffed mushrooms before. So I thought, oh what the hell, I will make it up! 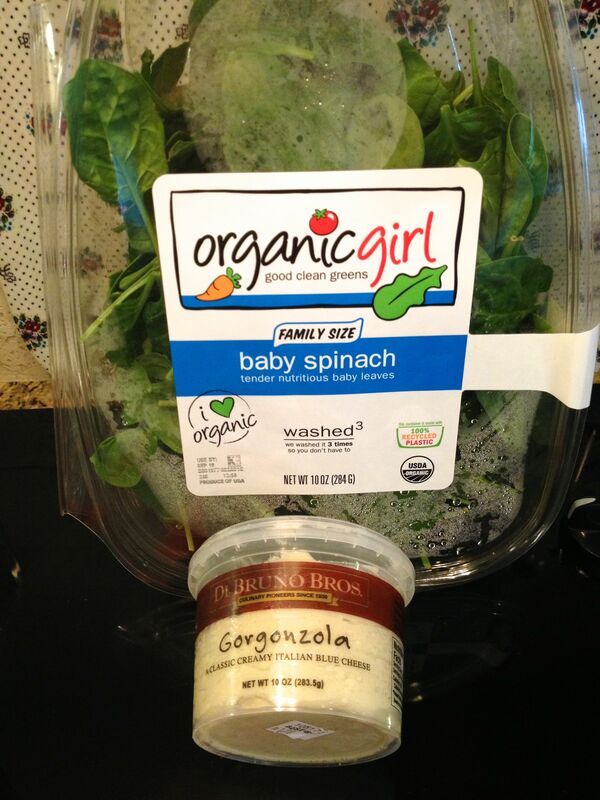 Now I SWEAR I didn’t plan this, but both recipes use Organic Girl Good Clean Greens in them! I promise you I am not an employee of the company, just a huge fan so we always have something of theirs in the fridge. 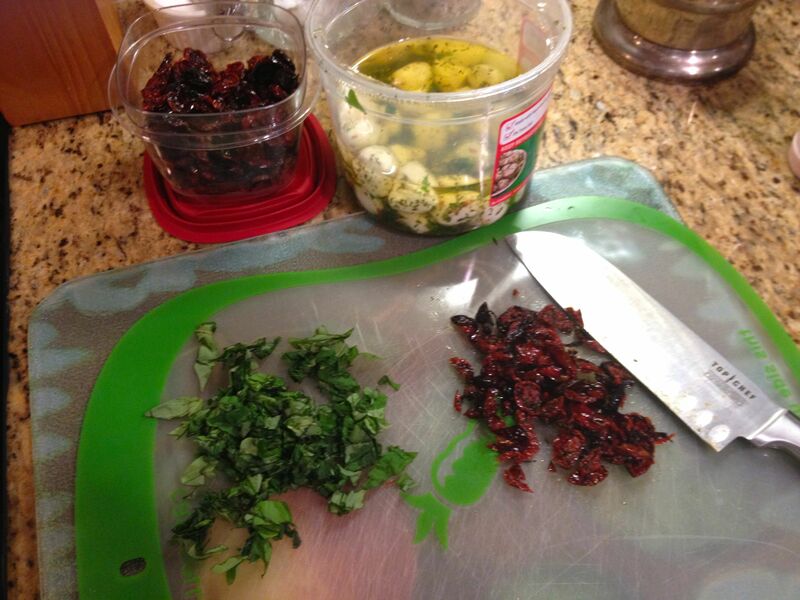 I am actually working this week on new recipes for a new product from them….but thats another blog post. 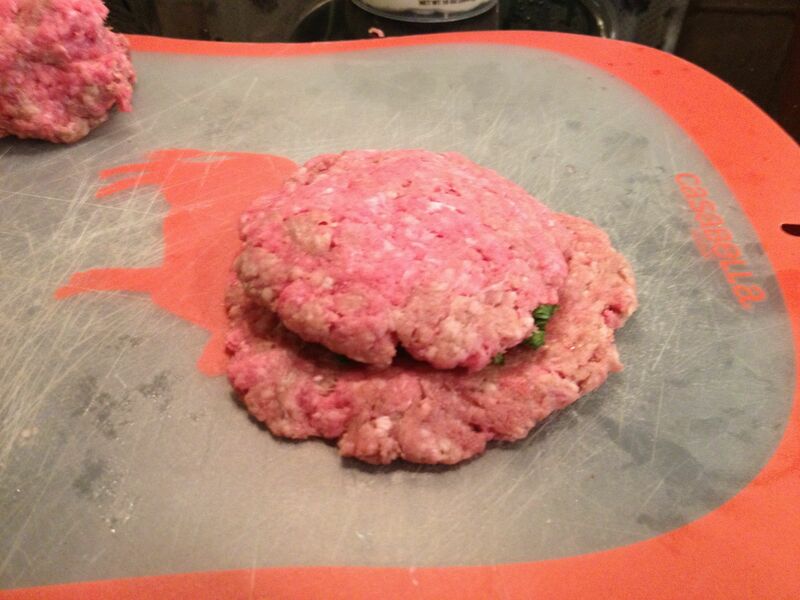 With so much meat at my disposal I decided to spilt it in half and make two different kinds. Chop the Basil, Overnight Tomatoes and marinated Mozzarella. I used marinated mozzarella balls because thats what we had. 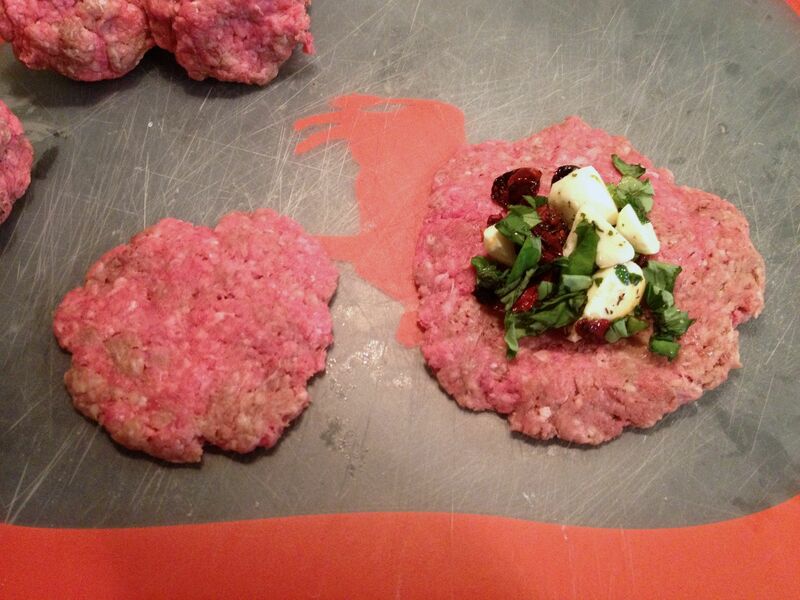 If I only had plain cheese I would have just minced some garlic to add in as well. Note on the Gorgonzola: Use whatever you like, Nonna and I were just thrilled to find DiBrunno Brothers cheese spreads at a store nearby. It’s a Philly place we shopped at and miss much! 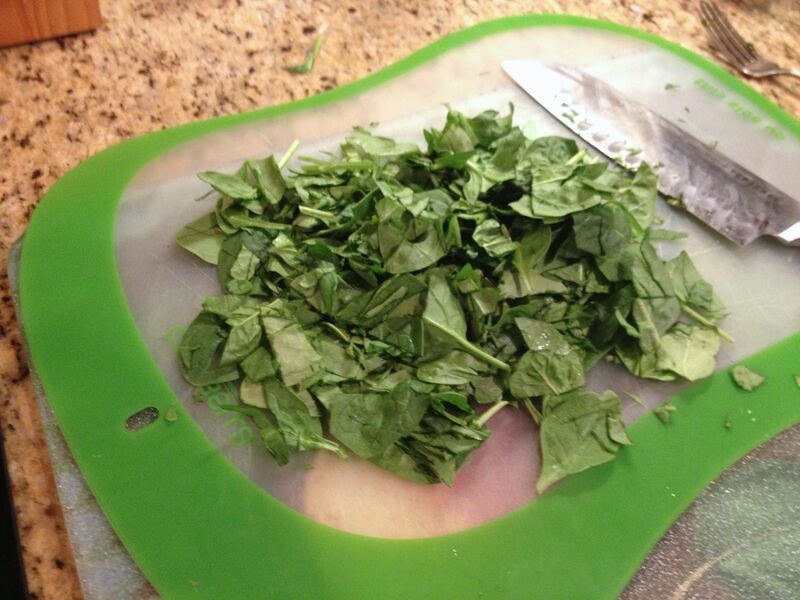 Chop up the spinach. Then it’s really easy. 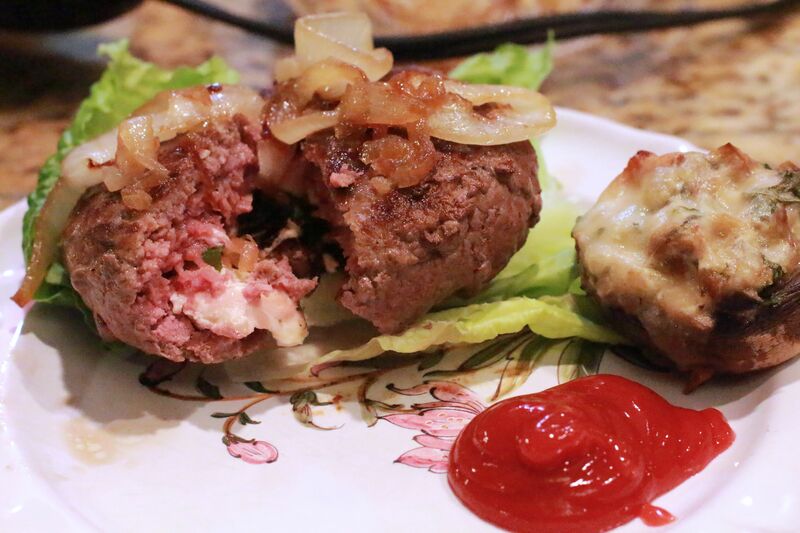 Make Stuffed Burgers. 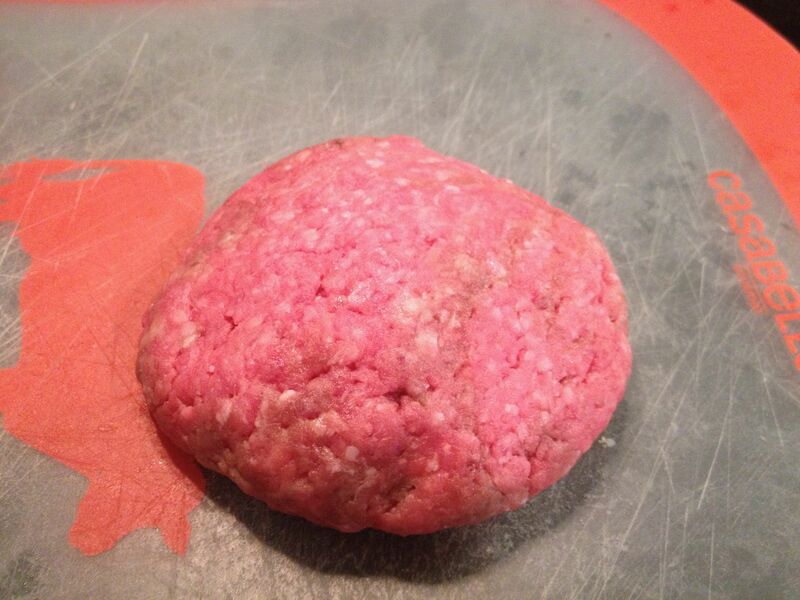 I like to make one patty larger then another, put the stuffing on the larger part, put the top on, and then fold the corners up and make into a nice thick burger. Do it whatever way works best for you! That’s it. Then I wrapped each one in plastic wrap, and put them in freezer bags. Try and get as much air out as possible, and don’t forget to label them! I’m almost embarrassed to put this up, it’s not even a real “recipe” but they turned out SO SO GOOD! So now it’s time for the mushrooms. 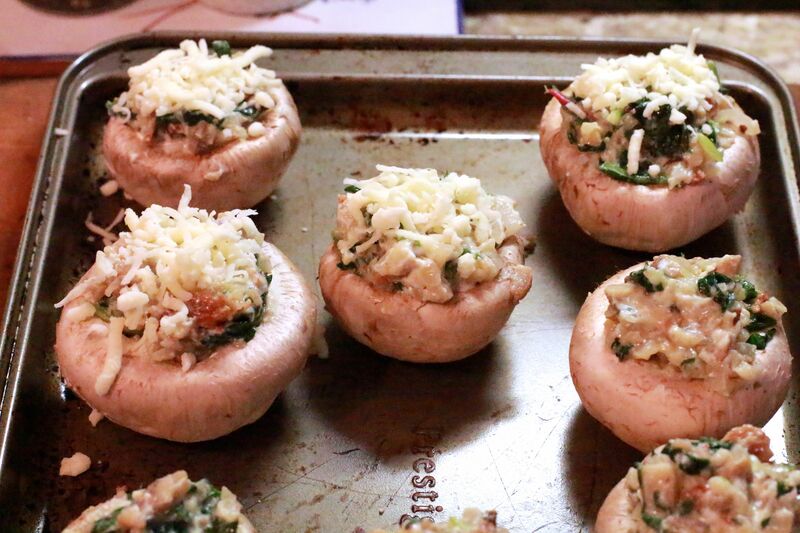 As I stated, I have never actually made stuffed mushrooms, but I figured I could make up whatever I wanted. These mushroom caps were so big, they were perfect. 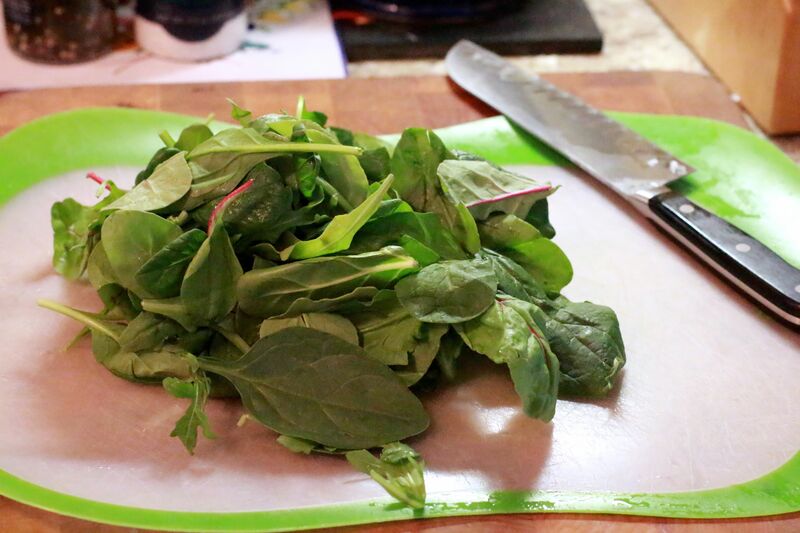 So I looked around the house, and as I am always on a mission to “hide” greens in food for the littledude, I figured I would add some in. 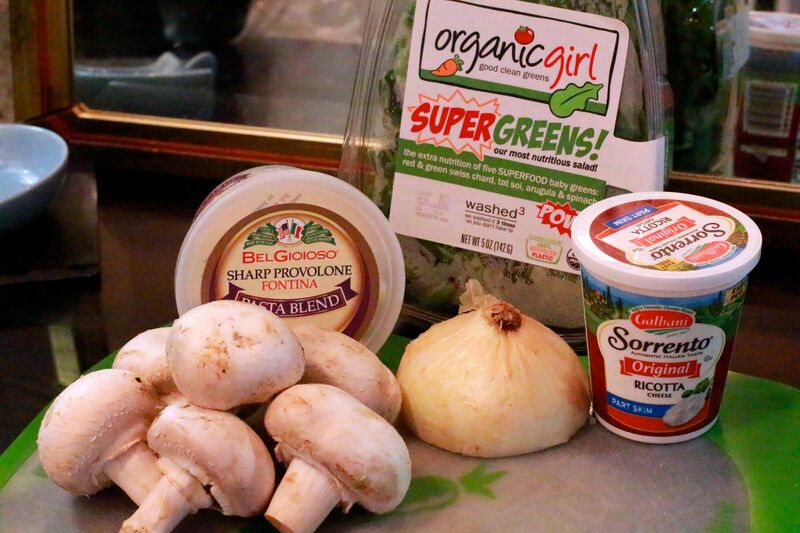 We had some Organic Girl Super Greens Mix, a few pieces of bacon, a sweet onion, cheese of course, and some Ricotta. I have no idea what made me decide to put Ricotta in them, but – well it worked! Clean the mushrooms. I was always taught to dry clean them with a paper towel. 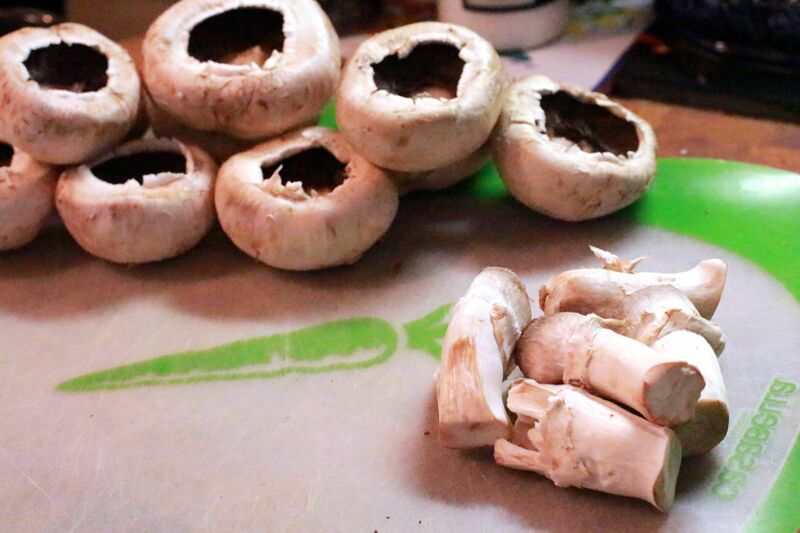 Make sure there is no dirt on them, and then remove the entire stem so you have a nice hallowed out mushroom cap. See what I mean? GI-NORMOUS Mushrooms! 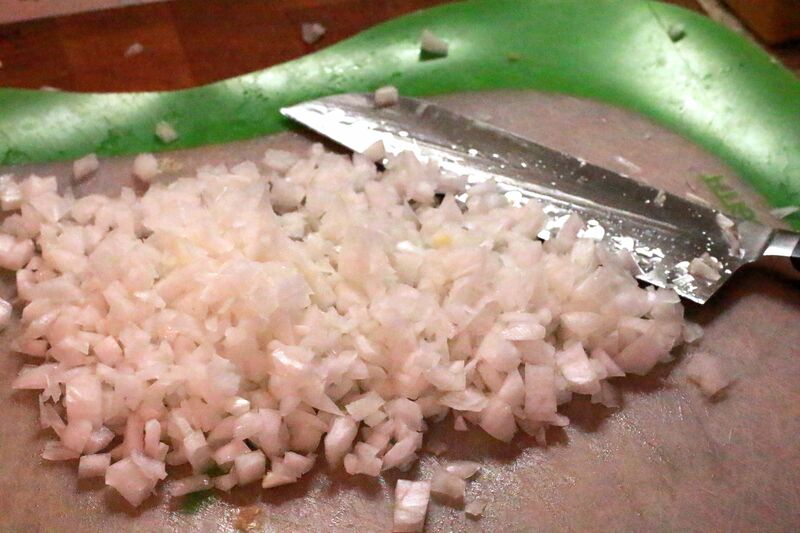 Next I minced the sweet onion – I use Vidalia onions. 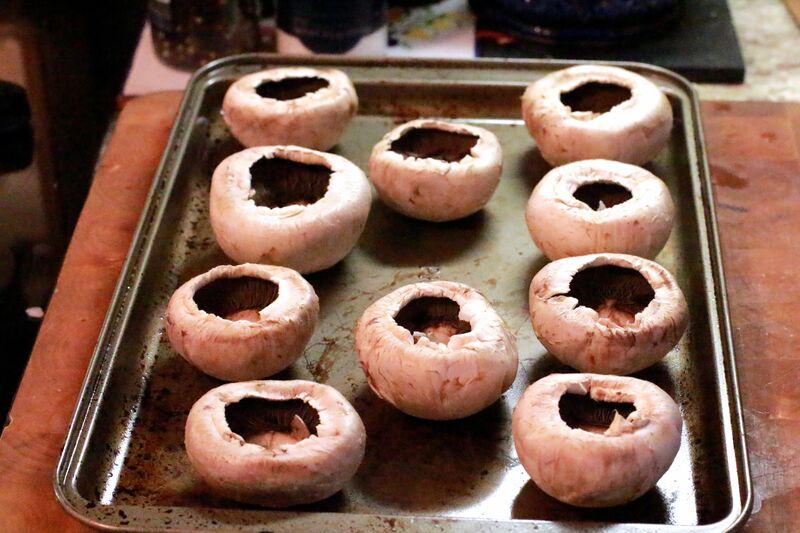 Take the mushroom stems and dice them up as well. 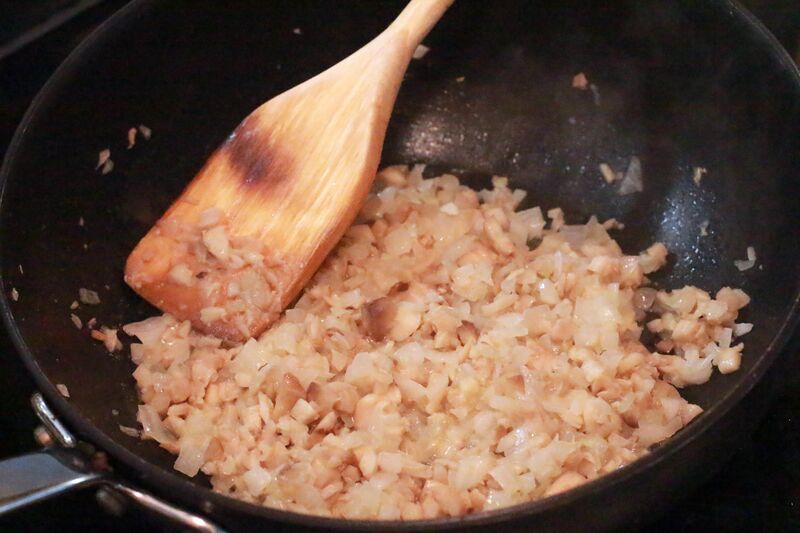 Put both together in your pan and sauté them in a little bit of EVOO, low heat to make the onions soft and fragrant and the mushroom stems cooked. While this is going on cook the bacon. Everyone has their own way but I am partial to the oven method. 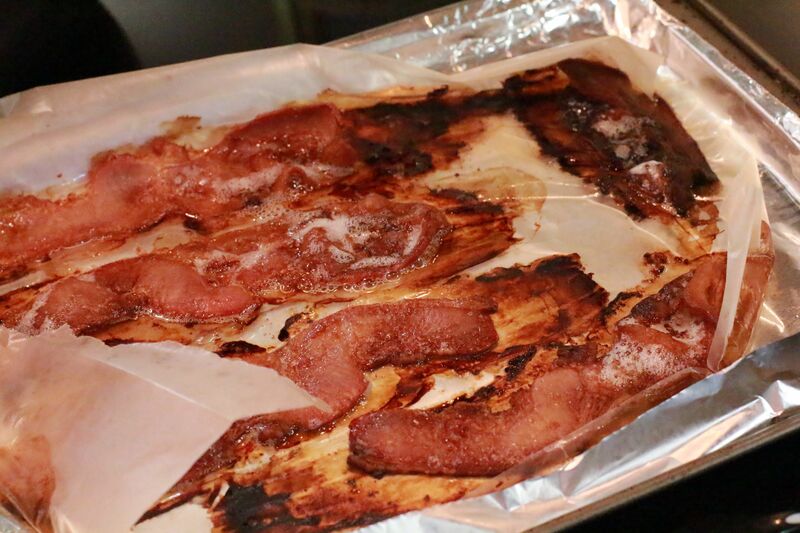 Just be careful not to get distracted and burn the bacon! It ended up being ok, very crispy and good for this. 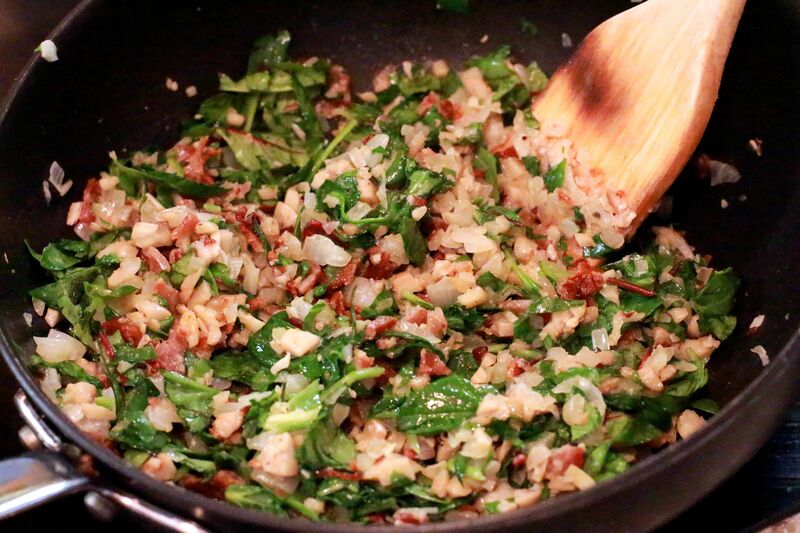 Chop the greens and bacon. 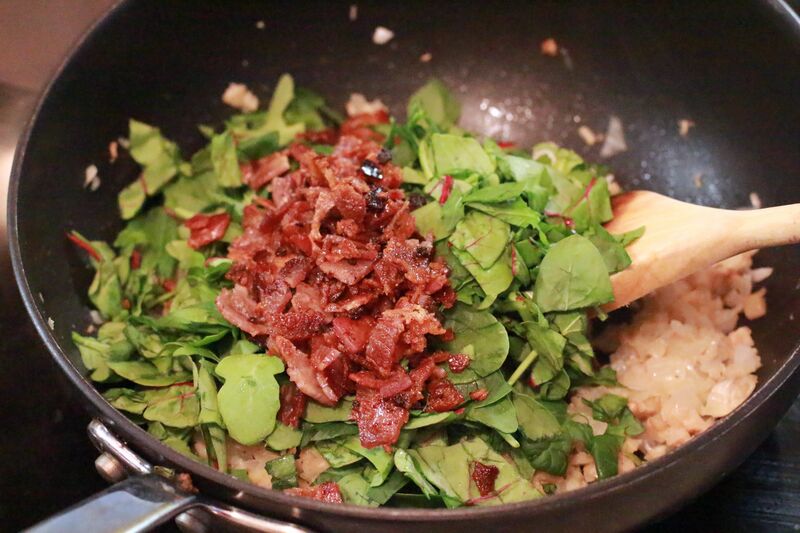 Add the bacon and greens to the onion and mushroom mix. 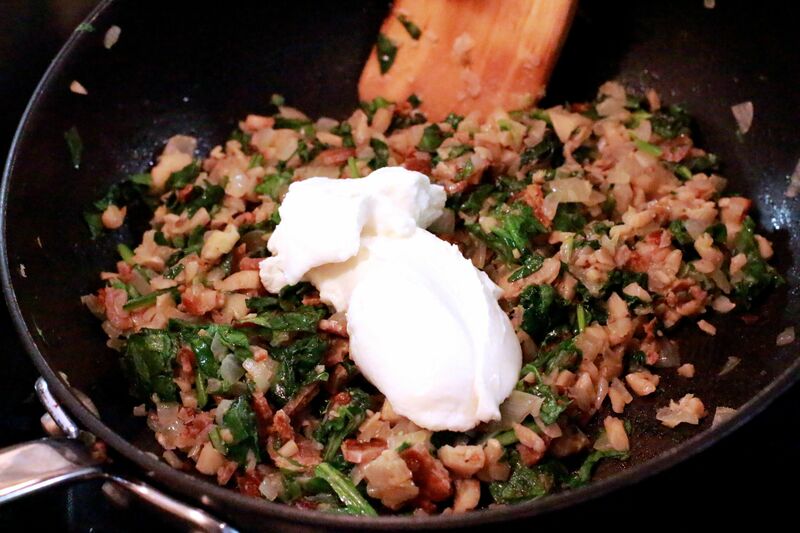 When it looks like this, the greens wilted and the everything thoroughly mixed…..
Add a scoop of Ricotta cheese and combine into the stuffing mix. This is my mixed shredded cheese of choice for the topping. 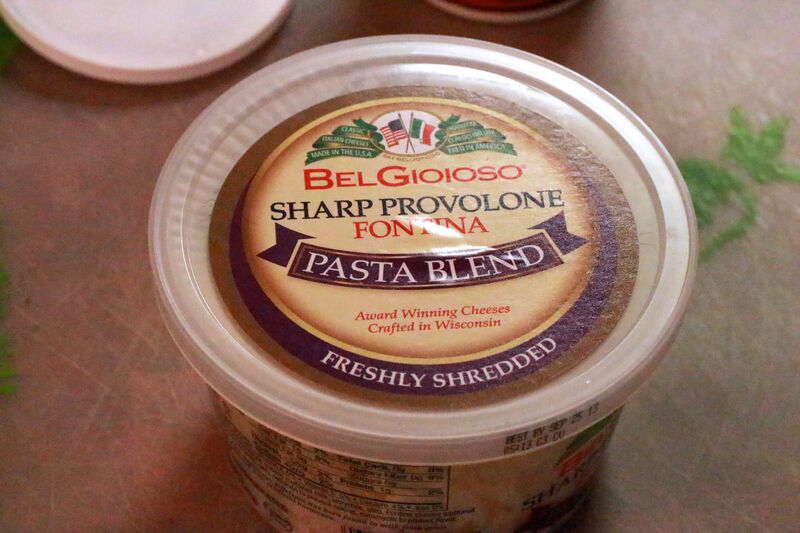 BelGioioso makes a few varieties, I liked the Sharp Provolone and Fontina…otherwise known as their “pasta blend”. Stuff away! Fill them to the top and then some! Then add the shredded cheese as a topping. I like to press it into the mix. 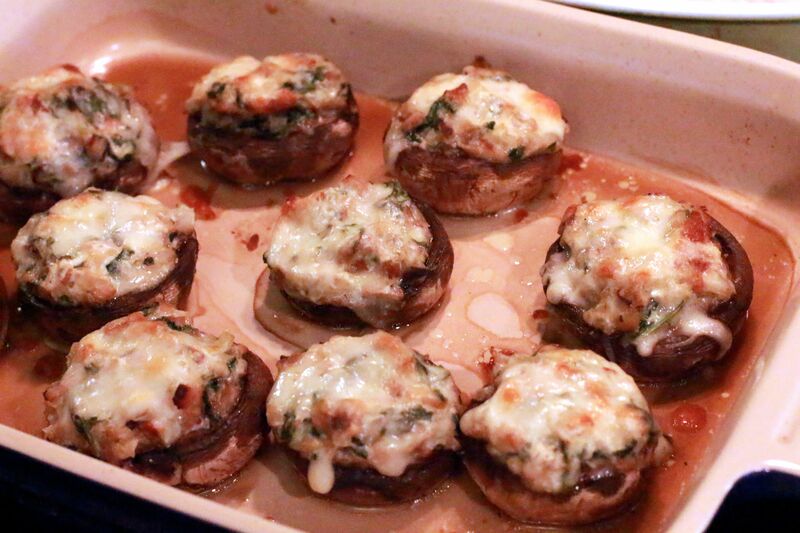 All melted and browned cheese topping and the mushroom caps are no longer white, but the nice brown color cooked mushrooms should be. Well that was my plate anyway. Everyone else had them on real fresh buns from the bakery. Bummer. I had mine over fresh romaine lettuce. Oh yeah I also caramelized some onions to go on top, cause that’s how I roll with burgers! Mine was a Caprase Burger. 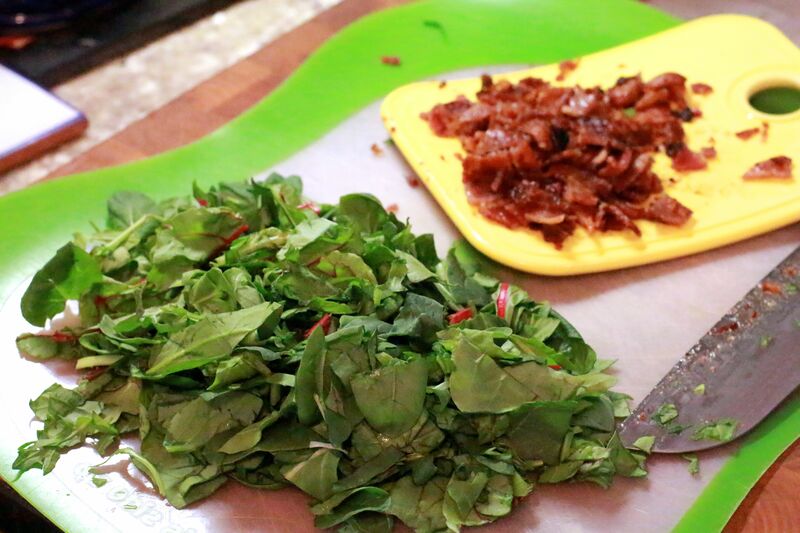 The Spinach and Gorgonzola was a hit as well, although the cheese in those leaked out a bit – maybe because it was a cheese spread. We had this meal at Nonna’s house. She gave the mushrooms a five star review and told me to remember the recipe! NICE! Littledude ate a very little of everything, it was a “no dinner – toast” night for him. Ladybug ate it all as usual! We sent a plate downstairs to a family friend/neighbor (he was watching a football and he knows we aren’t into watching sports at Nonna’s) and he loved it as well. Go forth and stuff away my friends, stuff away. And don’t forget to like Zia’s Kitchen on Facebook to see more fun things that happen on a daily basis as well as be the first to know about upcoming contests and giveaways!